Fourth of July nigh approaches. We hope you’re planning for fun on your slackline while enjoying other Independence Day (the movie) activities. It’s a great holiday to announce new and exciting things at Vinli! Slackline is our favorite way to work with our growing list of app integration partners. Slackline is one of those services we’d been waiting for but didn’t know it. 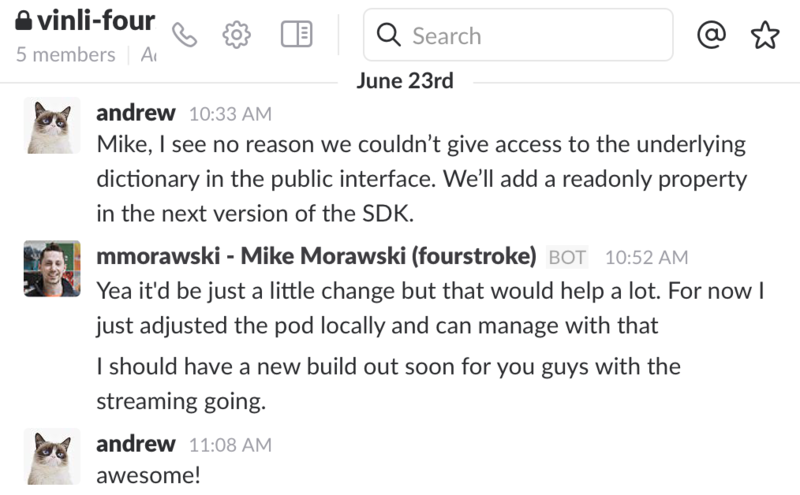 At its core, Slackline allows companies to connect with each other via a shared channel. 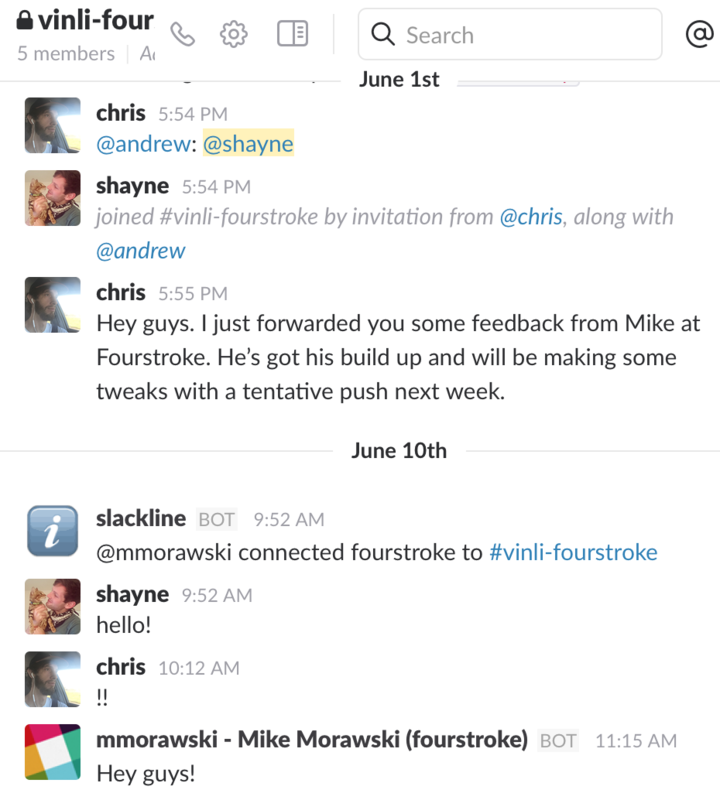 You simply create a slackline through your company’s existing slack domain and invite the other company to join via theirs. It’s that simple. We’re aiming to become the largest app ecosystem for the connected car, and as a result, Shayne and I spend the majority of our time working alongside developers and app companies. Once an integration has been outlined and agreed upon, we invite our new friends to their very own channel. There, we connect them with the appropriate iOS or android team at Vinli. With Slackline setup and ready to go, we kickoff work with our integration partners. This is done at their pace and convenience. Typically, one of the many Vinli team can resolve an issues for our partners in real time. This has not only proven to be a great way to build camaraderie, but we’ve also found it to be a wonderful tool for finding bugs and getting feedback. Thanks to all those who’ve helped us out! 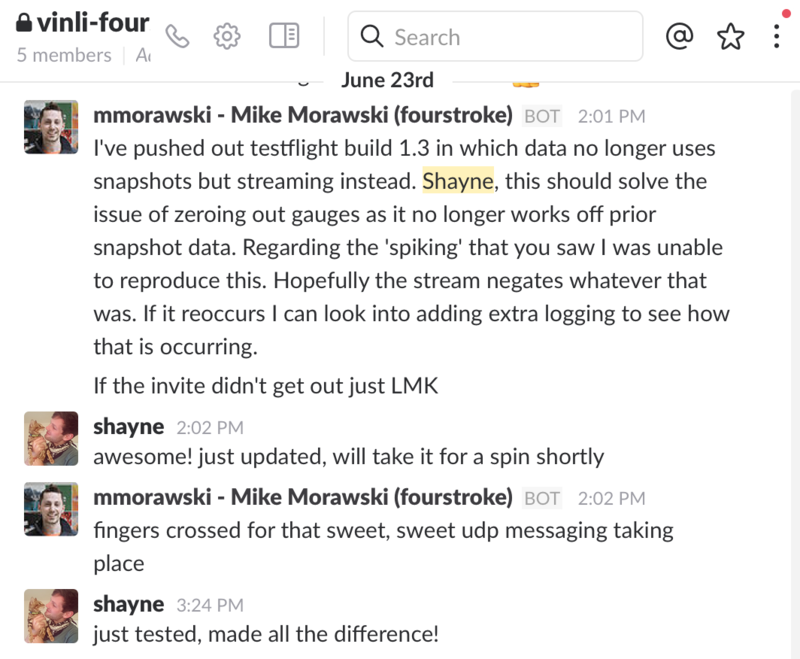 As you can see, once we’ve set up a slackline, we’re able to invite our team, and in this case Fourstroke, to our very own channel. (UDP (more info coming)); Shayne got to test it out in his new whip; I got to see Shayne giddy re-entering the office after a successful test; and then we get to let Mike know the test was a success. This is the fun part! We’ve found other use cases that we will outline in a later post. Until then, ping the Slackline team (just jump on their community channel!) and let them know you want to check it out. If you’re looking for a support tool that seamlessly integrates with Slack, allowing you and your team to engage with customers and partners in real-time, look no more. Shout out to Slackline for their stellar customer support. It’s been a pleasure working with y’all!